I write to you on the eve of my departure — this time to Selma, Alabama. I am volunteering for the next several days at the Unitarian Universalist Living Legacy event “Marching in the Arc of Justice,” commemorating the 50th Anniversary of Dr. King’s “March on Selma” in 1965 (also known as “Bloody Sunday”). The four-day conference will culminate with us joining Sunday’s march over the historic Edmund Pettus Bridge. It has been a while since you last heard from me, dear reader, and I’m realizing my online circles have expanded since then. If you are new to following along on my travels, welcome. I treat my justice trips as pilgrimages — journeys of the spirit and the heart, not just the body and mind. This blog was started in 2010 as a way for my family to follow along on my first solo justice trip to Phoenix. Since then, many more of you have joined me on my travels. Please treat this as a welcoming space, where comments are seen as “letters from home” while I’m away, and where we are all held to a standard of loving respect in what we choose to write. Usually, I give a longer notice of my departure date, often sharing pre-trip reflections before the traveling begins. This time, I have been struggling with the question of whether to blog on this trip at all, which is why you haven’t heard from me before this. Somehow, this time feels riskier. I am not an expert on issues of racism; I am not a historian with my mind full of timelines and textbook (or firsthand) knowledge of the Civil Rights Era. I am a person of faith who believes that the moral arc of the universe bends towards justice — but only if we come together and put our hands on it, lifting up the possibilities that come with open minds and loving hearts. This is why I continue to say yes to opportunities like this one; the world will only change for the better if we show up to the party, connect with one another, and dream big. It’s just that this time, it feels like a really big party. I mean, President Obama is going to be there. Additionally, my voice is not necessarily the appropriately representative one this time around. (See: white privilege) Living in Minnesota, I’ve been particularly aware of the conversations happening around #BlackLivesMatter, particularly as events have unfolded around the recent mass protest at the Mall of America. On matters of racial justice, I feel it is important to put my white self in the back seat and let the very capable leaders of color steer the conversation. And yet, writing to you, dear reader, has become an intrinsic aspect of these journeys for me. I hesitate to write, all too aware of my whiteness and my lack of expertise. From past experience, I’m also aware of how quickly blog entries like this one can result in unexpected reactions. But I also feel that to stay silent would be a betrayal of the commitment I’ve held with you for the past five years. It is a commitment that has both challenged and sustained me. Wise friends suggested alternatives for me to consider — journaling privately, blogging after I get back, sharing my reflections in a post-trip worship service. These are good suggestions. I may very well do all of them. But — I also have to do this. So please bear with me, dear ones, as I navigate these waters. I will write as I am able, offering stories and reflections in the moment so you can join me on this spiritual journey. I will share knowledge as I learn it, as I always do. But please know that this time, it is a more tender and vulnerable journey. And now it’s time to pack my bags. Off we go! I am an ordained Unitarian Universalist minister serving our congregation in Elgin, Illinois. While I am determined to embrace my propensity to wander, it oftentimes takes a leap of faith to do so. My life's motto seems to be: "Leap, and the net will appear." True to my spirit, and following Love's call, I must simply free myself to go. Where will I end up? Let's find out. Welcome to my journey! This entry was posted in 2015 Selma, Trips. Bookmark the permalink. 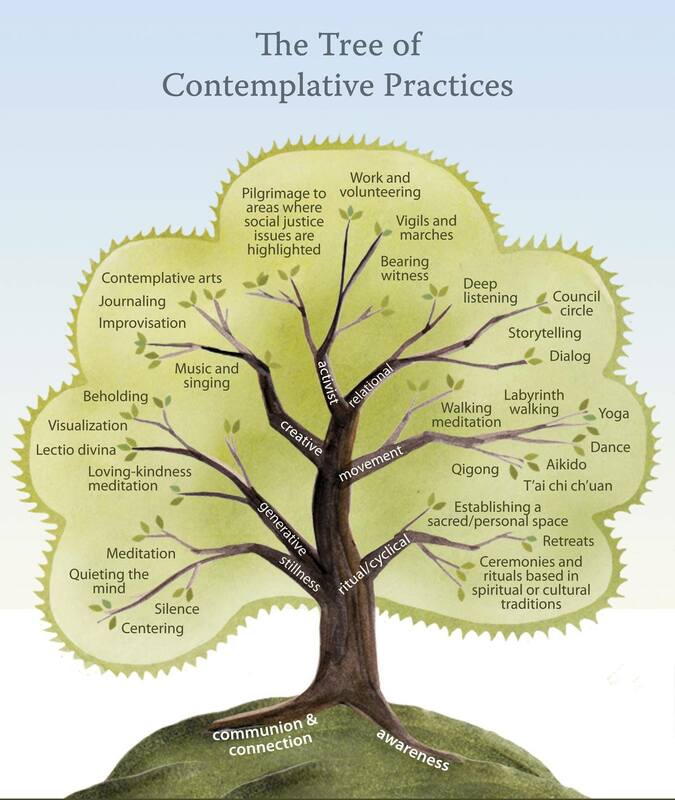 Leslie, I love ‘the tree of contemplative practices;’ what a powerful reminder of the myriad ways we can know and touch the wonder of being alive. Glad to be looking over your shoulder as you travel to Selma Your humbleness about the implications of your participation makes you, imo, worthy. Is She Coming to You?